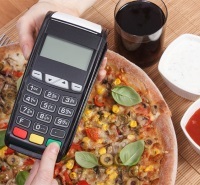 For convenience, speed, and ease-of-use, nothing beats a digital POS (point of sale) system. This is especially true for food truck owners, who tend to have only one or two employees and need all the help they can get behind the counter. 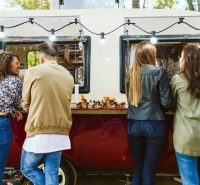 POS systems can also help food trucks collect data on sales to help them see what sells best and when, and can keep track of inventory and food casts down to the last cent. 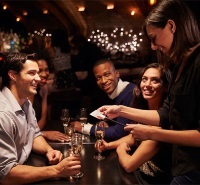 Finally, for small businesses that rely on word of mouth, POS systems can help optimize customer outreach. Before we take a look at which POS systems are best for food trucks, a few words about what a digital POS can do for a small food service business. Credit card transactions and bookkeeping: Most digital POS systems provide instant, secure credit card transactions and allow the customer to add a tip directly on the screen when signing the digital receipt. The transactions are collected in the system and easily organized by earnings, expenses, and labor costs – a real blessing when tax season comes around and food truck owners have to go through their records and get all their ducks in a row. Inventory and food cost: Most POS systems allow for extensive tracking of all company inventory at all times. In an industry in which food costs can make or break your business, a POS that lets you see the weaknesses or excesses in your supply chain can make a major difference. Remote management: Though it might be hard to imagine for a food truck owner who is constantly in the weeds, there will actually be times when you aren’t at your business. POS systems allow for remote management, meaning you can monitor sales and inventory and manage operations no matter where you are. Workforce: The data provided by a POS system can provide a great deal of insight on employee productivity. You can observe which employees have the best sales and which workers are best at handling a high volume of work. When looking into a POS system, it’s important to consider what your needs are and which extra features just aren’t relevant for you. A food truck won’t need many of the features of a larger, enterprise establishment, such as planning table reservations and the like. 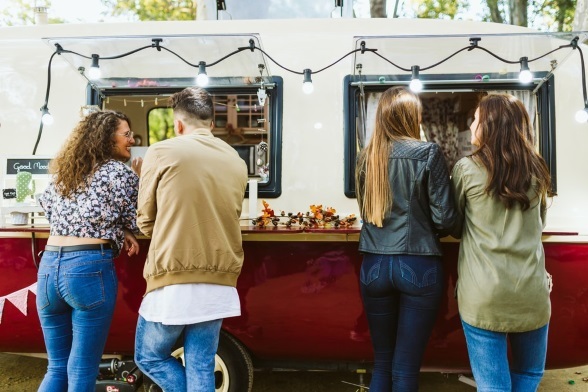 A typical food truck has a very small workforce, so a system that is easy to operate is key, as is reliable customer service that can provide prompt answers if things go haywire. In addition, unless you plan on expanding to more locations in the near future, a company that offers discounts as the number of POS registers increases probably won’t be a deal-maker. In addition, companies that provide lower credit and debit processing fees will help a small business cut expenses. Still stuck? Let’s take a look at some of our leading partners, and see which one works best for your business. Shopkeep is the most affordable option on this list, and it comes with a large number of helpful features to boot. Like many POS providers, Shopkeep has its own mobile iOS app – Free ShopKeep Pocket – which crunches reams of data to help you keep up to the minute on your food truck’s sales and inventory. Shopkeep offers the BackOffice account management portal, which food truck owners can use to manage inventory, sales, and more. If you really want to get deep into the minute details – as a responsible food truck owner should – you can integrate BackOffice with Shopkeep’s raw goods tool, which automatically calculates inventory based on the ingredients used in each item sold. In other words, if you ring up an order for al pastor tacos it will calculate the food service requirements for the order down to the pork, tortillas, even the fresh pineapples chunks. This data is then deducted from the supplies logged in the BackOffice portal, so you can keep track of when it’s time to resupply. In addition, while it’s a cloud-based system that can be accessed remotely, Shopkeep is also set up to be able to run offline if needed. Revel is a POS industry giant that is set up to handle businesses of all sizes, from food trucks to enterprise level businesses with many locations. Nonetheless, while Revel is built to handle major businesses, Revel Food Truck POS software is tailor-made for food trucks. The software incorporates Revel’s “insights” real-time data which can be accessed remotely through a mobile app that also allows for off-site restaurant management. The data accrued by the system helps food truck owners plan employee hours management based on forecasted sales, which should help efficiency and labor costs. More than maybe any other food service business, food trucks live and die off word of mouth. Revel integrates a food truck’s social media accounts so they can be managed directly from the POS platform. The software can also work offline if needed. Revel isn’t the cheapest POS system, and its pricing can be confusing and/or not readily available without scheduling a consultation with a sales rep. Still, prices begin at around $119 for a single register, which is probably enough for most food trucks. Touchbistro​ is an industry leader that was developed by food service workers who know the ins and outs of running an eatery. Perhaps this is part of the reason why it is the top grossing food and drink app in over 37 countries, according to the company’s page on the Apple App store. For a mobile food industry, the fact that TouchBistro can run offline is a plus. Chances are you’re not always going to have reliable WiFi service, and TouchBistro makes sure you don’t miss a step. It’s an intuitive interface which is easy-to-use even for beginners, and it collects all of your food truck’s sales and inventory information through cloud reporting, which can be accessed remotely by way of the app at any time. The reports detail which items sell best and when, down to the minute, allowing you to decide how to manage your inventory, food costs, and labor. In May 2016, Upserve​ acquired Breadcrumb POS, which takes pride in being a POS company founded by food service workers specifically with the food service industry in mind. Like TouchBistro, it can operate completely offline, which can save your lunch service if there’s a sudden power outage or the WiFi for crashes. While offline, credit card charges can be taken and stored securely until internet service is restored. And while customer service was not a strong point of Upserve’s in the past, since it acquired Breadcrumb POS, it has integrated 24/7 customer support by phone and email. The Upserve Live mobile app also provides users with mobile data reports covering everything from sales to labor. It helps you optimize your customer outreach, with “Upserve Loyalty,” which can create a reward based system for customers, replacing the old punch card in the wallet of yore. Toast is an affordable, easy to use POS system with an intuitive, drag-and-drop interface that should be a breeze for any employee to master. For an extra $50/month, Toast can run integrated online ordering, which allows customers to place orders online and buy gift cards from your business. The “quick edits” feature allows users to change the menu and service options at a moment’s notice, helping staff to keep track on sales and inventory. When it comes to apps, there are currently at least 29 different food service centered apps that can integrate with Toast. One drawback is the customer service, which includes a phone line “for emergency issues” and an email “for moderate issues.” While representatives do work 24/7, Toast doesn’t appear to have invested as much in customer service as some other POS companies. A sophisticated, affordable, and easy-to-use digital POS system is a must for any food truck that wants to optimize its customer service and use of data for food service and labor management. Never have there been more options available, and by taking a step back and looking at your needs and budget considerations, you should be able to find the best POS system to suit what your company needs, and can take your food truck to the next level.